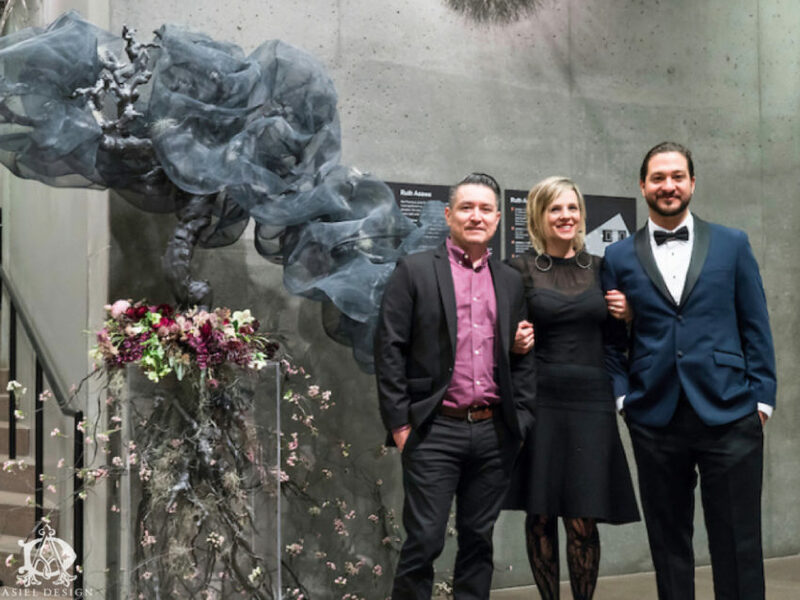 When we wrote a blog about Ruth Asawa’s work 3 years ago, we had no idea that we would be paired up with this artist for the Bouquets to Art exhibit. It must have been Divine providence because her work speaks to us on so many different levels. From her use of interesting and unique materials to the concept of negative and positive space, Asawa is an artist to be revered. Interpreting her crocheted wire sculptures deemed a fun and inviting task. Immediately we were drawn to the shapes and shadows that the light created by piercing through the weave. As Asawa said, “enclosing it without blocking it out.” There was this ethereal otherworldly presence and we were bent on finding a way to exude that in our installation. To help us do this, we called on our truly talented sculpturist/artist, Tulio Flores. If you know anything about ASIEL DESIGN, you know we love organic shapes and embrace the unusual. Trees embody just that…seeing what’s above ground, but rarely seeing what’s underneath. Sometimes it’s the things we don’t see that inform us the most. 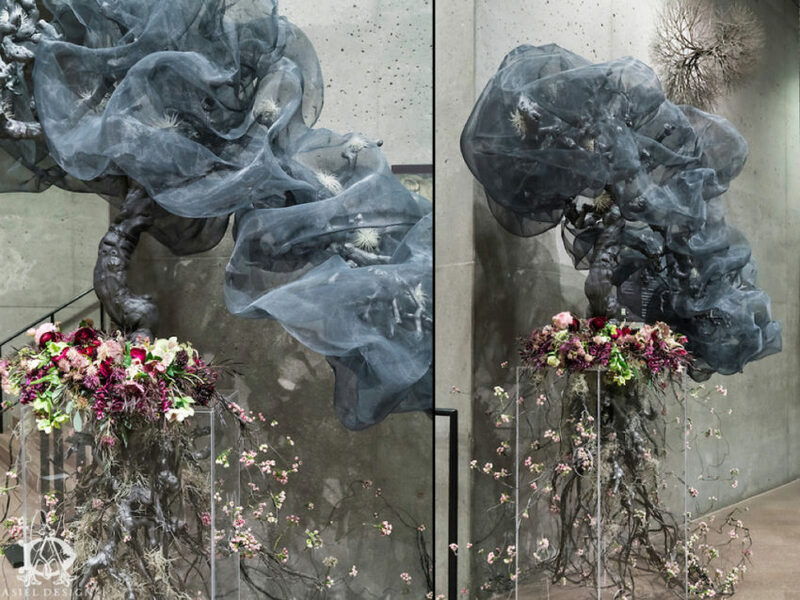 In this installation we strive to show that beauty exists in the most unexpected places. 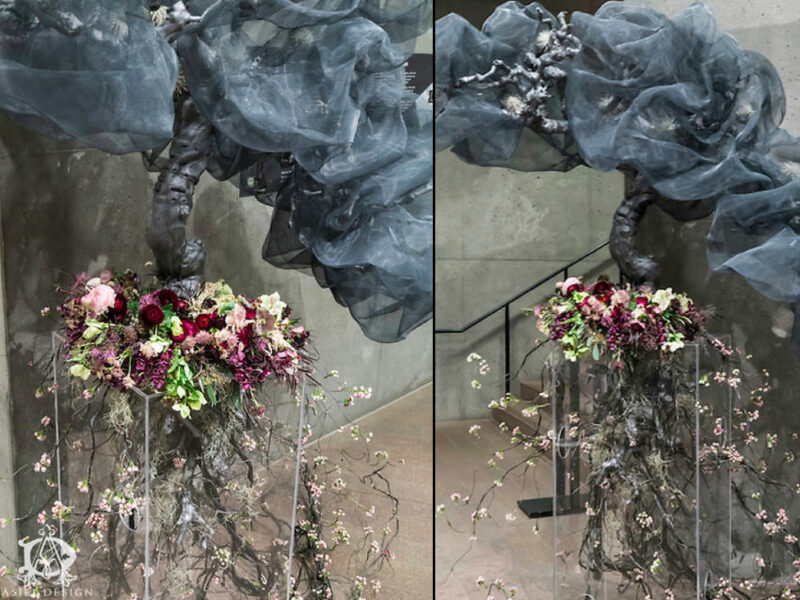 Emerging from this “floating tree” are natural and forged elements. There is this sort of transcendence taking place and we get to experience it. The lifeless tree stops at nothing to bloom…even from its roots. I think we have depicted that perfectly here. It was a privilege to create a piece alongside one of the great artists of our time, Ruth Asawa. We hope that this boundless tree will plant a seed inside you to remember your depth is not only beautiful but also blossoming. Partnering with Tulio Flores is always inspiring. He spent countless hours bending wire and collaborating with us to make this dream a reality. Tulio took this from concept to inception and we are forever grateful for his contribution.